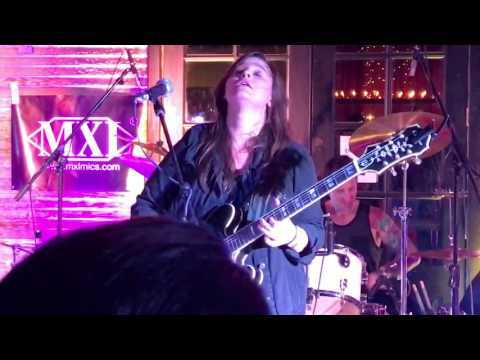 Emily Wolfe is a solo Rock n’ Roller who plays an incendiary blues style. Hailing from Austin, Texas, Wolfe brings a unique blend of singer/songwriter components to a structured rock song. This could be based on Wolfe’s excellent guitar playing capabilities that immediately makes everyone listening become envious. From the first listen, you know Wolfe is a musician who should be heard all over. Secondly, from the live videos I’ve seen, this musician has the chops to not only command the audience to dance or jump around. But, overall Wolfe brings a presence to the stage without even trying. Even more impressive is that Wolfe is a self-taught musician and has been around since 2012! Some have even credited that Wolfe sounds like a sonic merging between Jack White and PJ Harvey, while those names are honorable… Wolfe has a whole other essence which makes songs like “Holy Roller” memorable. “Holy Roller” shows off enough of Wolfe’s ability to mix and match her vocals with a heavier sound. While Wolfe has a softer voice, you surely hear the heightened levels of surging electric rock pierce through the microphone. And truth be told there are not enough female musicians broadcasted to a wider audience that deserve at least a mention. As seen below in the live video of “Holy Roller” there is no shortage of energy throughout. From the first seconds when Wolfe slams down on the strings, you can already feel your heart start to race because at any moment this crowd could get a little rowdy. Yes, it’s because Wolfe’s singing, style, and ultimate gusto show an individual who is in love with playing music. This is about how the song ends up being interrupted through a few minutes and Wolfe goes out of her way to make her mark without even trying.